designboston: Design blog based in Boston, featuring news and information about architecture, interior design, product design, and green design from around the city and beyond.designboston: Paul Lukez "Suburban Transformation"
Paul Lukez - Somerville-based architect and Assistant Professor of Architectural Design at MIT - has released a new book, Suburban Transformations . 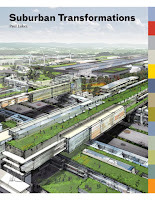 In it, Lukez "outlines innovative proposals for restoring sustainability and energy efficiency, as well as unique, inviting identity, to America's suburbs. He presents meticulously detailed plans for Boston suburbs Burlington, Dedham, and Revere (as well as locations in China and the Netherlands) and introduces a detailed mapping system (called the Adaptive Design Process) that gives suburban planners, developers, and residents a method for envisioning a range of dynamic futures for their communities." Along with the book, Lukez has set up a complementary site, "a repository for design ideas and reference for suburban design and development." The book and site are meant as a catalyst for discussion on creating sustainable suburbs that have "a distinct character and unique identity." Chris Kelly, Lukez's PR rep, told me the book is academic, yet an interesting read. He is sending me a copy of the book to review. I am quite interested to read it, both for myself and for review. Once I'm done, I'll let you all know what I think. If you have any books, new products, or whatever that you would like me to review, please contact me. I think my husband would love this type of book. He is very interested in planning and travel systems etc. I am eagerly awaiting your review as to if it is something I should pick up for him.